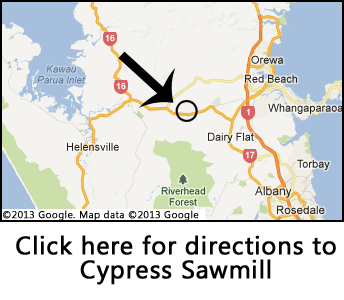 Cypress Sawmill is located only 20 minutes north of the Auckland harbour bridge, between Dairy Flat and Waitoki, close to Silverdale, Kaukapakapa, Helensville, and Orewa. We are open to the public, so feel free to drop in and see our range if you are in the area. If you are unable to make it into our Auckland timber yard, please phone, email or fax your details through to us and we can quote and deliver to anywhere in New Zealand. In many cases we can also ship our New Zealand timber products overseas. We list a selection of our products on Trade Me under the member names "cypress-sawmill" and "woodcutter". Follow the links to see our current auction listings. Please complete the form below providing as much information as possible about your timber requirements, and we'll contact you as soon as possible.